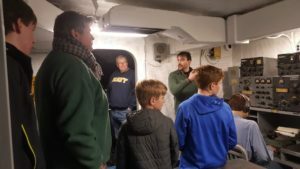 The Building History activity for April will be “Making Radios.” This program, free to experience with the purchase of any tour of the Battleship, will take place on Saturday, April 20 from noon to 2pm in the Officers’ Wardroom. Join the Battleship’s Curator, Ryan Symanski, as he’ll lead guests in playing with the components of small radios. Guests will have the opportunity to put components together to make a simple radio.